I don’t know who all did these apps, but they are good!!! I like how easy they are to download and they cover a lot of math material! They work the problems out step by step and solve Physics problems fast. I am not sure how you can make them better when they are the best I have come across. I couldn’t find any like this and when I did, there not clear with step by step like these. I will tell others about it. Thank you all for helping students. Need to solve the Diver problem in Physics? Have a TINspire CX ? Now enter final velocity, the angle the diver makes with water and the height of the dive board. We are going to find the magnitude of the initial velocity in a backwards way. 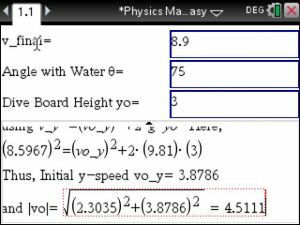 First , we find the x and y components of the final velocity using sin and cos.
Next we find vo_y using vf_y , g=9.81 and yo. Voila, diver problem is solved. The Gaussian mirror equation ( the mirror and lens equation – look at https://en.wikipedia.org/wiki/Curved_mirror ) can now be solved using the TiNspire’s CX Physics Made Easy App. As usual, it you will get step by step solutions. 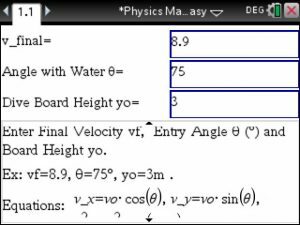 The Physics Made Easy app was an essential piece on my way to a 5 on the AP Physics 1 exam. It allowed me to feel more confident doing a variety of problems, especially projectile and rotational motion. 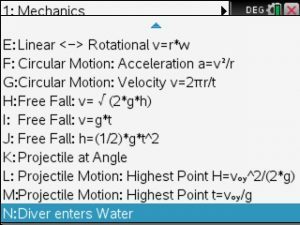 While the app’s features of forces (e.g. friction), electricity, simple harmonic motion, etc. 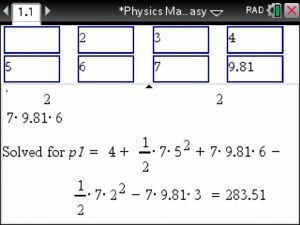 were extremely helpful, the problems I encountered throughout my physics courses were relatively basic in comparison. The aforementioned problems became trivial with the help of this app. The app also allowed me to cut off several minutes of pesky checking on long projectile and rotational motion problems. It was very useful to get a step by step display of the problem if I got it wrong on an assignment or a practice test, for example. 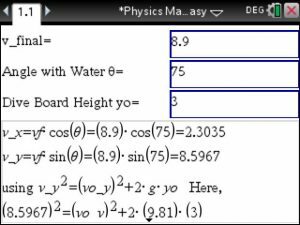 This is THE physics app to have: 3-4 semesters of Physics in this comprehensive Physics App for the TiNspire CAS CX calculator. 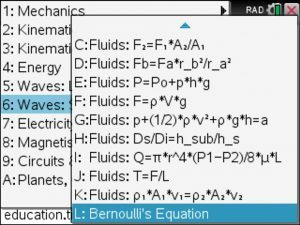 Also included is the ENTIRE periodic system, specific heats, constants, and much more. I am glad that you remembered me. I apologize for the length of my letter. The last time I had contacted your company was spring 2014 when I was taking the calculus classes. By the way, your CME application was the ONLY reason I got an “A” grade in both Calculus 1 and 2 which helped propel my GPA that year from 3.14 up to 3.64. I went on to take 2 Biology courses and 2 History courses and got 2 “A’s” and 2 “B’s” respectively and going into this fall semester my GPA is 3.58. My GPA needs to stay above 3.50 for me to maintain my membership in the “Phi Theta Kappa National Honor Society.” I have successfully taken all my required liberal art courses for my Business Administration major and Physics is the only one left. After this course I have only Business Administration course, which was not the college’s recommended way of taken course, but I wanted to get rid of all my liberal art courses so that I could truly be going to college strictly to be taking nothing but Business Administration course. If I could get through this last liberal art course with my GPA above 3.50, I would feel like I had gotten through the hardest part of college. So at 54 years of age trying to maintain a GPA above 3.50, I need all the help I can get through the use of your Physics applications this semester. Thereafter, I will need your business applications the rest of the way until I get my bachelors degree. So from this point forward, keep my email address in your database because I will be a returning to you to purchase various business applications per semester according to the subject matter, i.e. finance, statistics, accounting, economics, etc. Per your suggestion, I am going to purchase the Physics app after I send you this email. I got the TI nspire CX CAS a few months ago because of its larger storage capacity for installing many business apps that I anticipate needing to install in the near future. 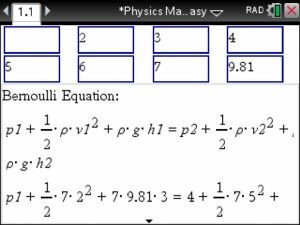 It also has a much brighter and colorful display screen which helps in visualizing a complex problem in picture form, especially in physics. If I can I may send you a few physics problems.